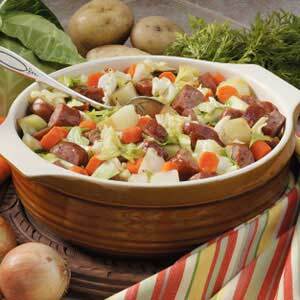 Sausage, cabbage and carrots Oh Boy! Add the onions and carrots and garlic and saute until soft. Add the cabbage, salt and pepper (to taste) sausage and cover the pan. Siciliana is the freatured sausage Pork with white wine, garlic, wild fennel, coriander and other spices. $9 for a pack. Tom is selling carrots for $2 lb and garlic typically is $2.50 per head. Small onion from anyone is about $2. The market also has meat, fish, eggs, yogurt, cheese, butter, chicken stock, almond butter, prepared foods, walnuts, almonds, bakery items, olive oil, vinegars, condiments, candy, jams, fanciful local preserves,soaps, lotion,freshly ground spices, plants -decorative and culinary and a wonderful world of locally produced crafts. We aren’t waiting for the first of the year to start our New Year’s resolutions. The market’s goal is to bring recipes for ingredients in the market now. This is for a version with potatoes and leeks, but you can add all kinds of things to change it up: greens, sausages, cauliflower or perhaps carrots. *If cooking gluten-free, be sure to use gluten-free broth. 1 Cook leeks in butter with salt and pepper in a medium sized sauce pan. Cover pan, cook on low heat for 10 minutes. Check often. Do not brown the leeks. 2 Add water, broth, and potatoes. Bring to a low simmer and cook for 20 minutes. Scoop about half of the soup mixture into a blender, puree and return to pan. Add marjoram, parsley, and thyme. Add a few dashes of chili sauce to taste. Add some freshly ground pepper, 1-2 teaspoons salt or more to taste. The market is the go to place for great gifts and great gift ideas! Saturday December 21 the market is the go to place for the go to gift. Give someone who doesn’t shop at the farmers market a gift certificate and maybe a couple of carrots too. For people used to eating grocery store produce developed for appearance and shelf life rather than taste — the gift of food with flavor could be life changing. Gift certificates are available at the information booth. Passionate Foodies on your list? Local Spicery has a big variety of gift items from $5.00 to let’s go crazy and sign a friend up for their Spice Adventure Program Local Spicery has their own mill. You won’t find fresher or better quality spices anywhere. The clever aprons from Threads of Time make any cook look good. Waterhorse Ridge uses fruits and vegetables they grown themselves supplemented with produce from the market to make the most wonderful preserves, salsas, vinegars and just the best stuff you can imagine. Got a carnivore on your list. If they aren’t eating locally grown meat and poultry they are in for a real treat. The Saturday market has beef, lamb, pork, rabbit, quail, duck, chicken, sausages, jerky, hot dogs, bacon and more for that carnivore. Just a few years back, there were no local ranchers at the farmers market. Northern California has seen a boom in small ranching and the variety and quality of meat at the market is the result. Stop by the information booth on Saturday December 21st and we guarantee we will find you the perfect gift for anyone on your list. A great line-up of vendors for this week. It may be the 11th hour but you can still look like you spent all year searching for the perfect present. Of course the best selection of Sonoma grown fruits and vegetables. Not too mention bakers, ranchers, and chefs. There is no Wednesday market this week – closed for Christmas Day. Music Barbara Thompson will sing Christmas songs! Shopping and Eating you can’t go wrong and some wonderful gift ideas too! We are having a heatwave! Chef Jennifer Una will not only be cooking but doing some accounting too. She will provide cost breakdown for what she is preparing. One more cold night..but it is going to be warmer just in time for the Wednesday market. Lots of local produce, meat, bread and cheese. You can have breakfast, shop for the freshest, local ingredients and do some holiday shopping all in one place. A place with lots of parking and no long check-out lines. The good news is – it is not going to be as cold Saturday and it won’t be raining. More good news: Ma and Pa’s is back with their wonderful celery root. More good news music by Two Loose Pegs — fiddlers with Scottish leanings. Absolutely wonderful news: John Rizzi will be demonstration glass blowing. John has been at the market selling lovely glass jewelry. No bad news another great line-up of local farm and food vendors.